The Morne Trois Pitons National Park in the island country of Dominica, in the Caribbean, is an area of significant volcanic activity. Located within the boundaries of the park’s nearly 7,000 hectares are five volcanoes, dozens of hot springs and fumaroles and a very large and famous boiling lake. 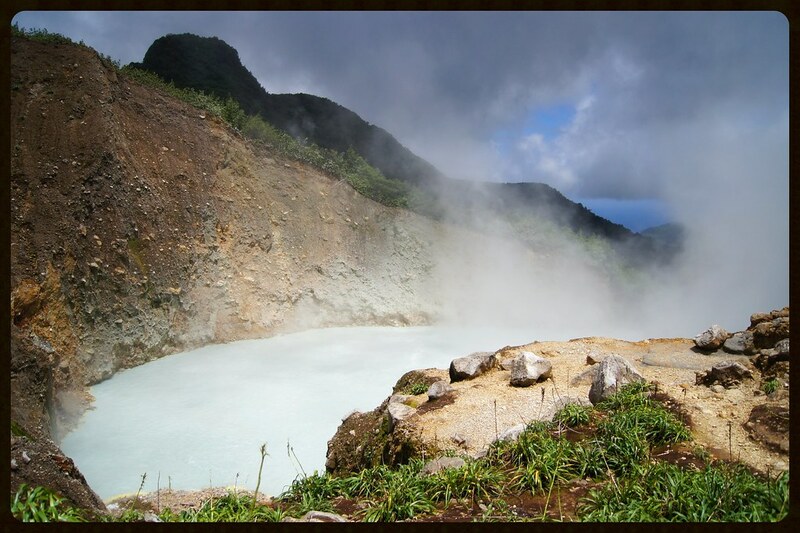 Dominica's Boiling Lake is actually a flooded fumarole, which is an opening or a hole in the Earth’s crust. It is filled with bubbling greyish-blue water at temperatures of around 90°C. The water is heated by hot steam and gases escaping from molten lava below. The surface of the lake is usually enveloped in a cloud of vapor. The lake is around 76 meters across, making it the second-largest hot lake in the world after the Frying Pan Lake in Waimangu Valley near Rotorua, New Zealand. The lake was first sighted in 1875 by two English gentlemen who were working in Dominica at that time. Later that year, a government botanist and one of the original discoverers were commissioned to investigate this natural phenomenon. They measured the water temperature and found it to range from 82–92 °C along the edges, but could not measure the temperature at the center where the lake is actively boiling. They estimated the lake to be about 60 meters deep or more. The lake is fed by rainfall and two small streams which drain into the area. The water then seeps down to the lava and is heated to the boiling point. The lake’s water level keeps fluctuating and the activity of the lake also lowers from time to time. The lake had almost disappeared after a phreatic eruption occurred nearby in 1880, and formed a fountain of hot water and steam instead. The lake had another dramatic fluctuation in 2004-2005 when its level got lowered by 10 meters, and then recovered in a single day. Geologists believe that the lake is suspended above the local water table, which explains its rapid draining and refilling. A continuous flux of steam or gas generated by an underlying magmatic intrusion drives water up into the lake. A disturbance to the supply of gas can cause the lake to drain through the porous connection that normally allows steam to rise and heat the lake.